Sustainable, ethical fashion to me is producing clothing in a way that customers are aware of every step of the process. I intend to write about the complete cycle of making a garment, but first I wanted to show you where it is I actually do all the sewing. I live in a house in a countryside town in Finland with my husband and our sweet (but a little goofy) dog. 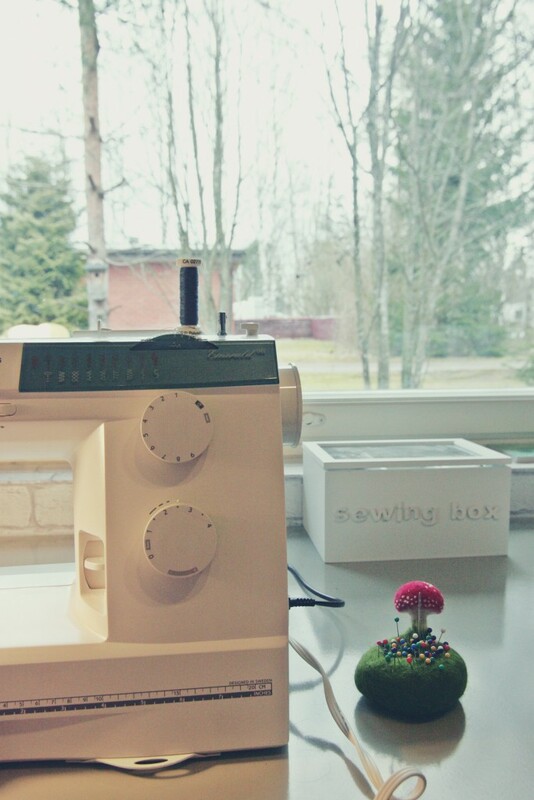 When I decided to turn sewing from a hobby into a real business, I slowly started making plans for a workspace. We had a couple of spare rooms with their only purpose of being storage spaces – you know how it is when you don’t have an actual plan for a room! So I cleared out all the junk – ehm, belongings, and asked a friend of mine to help out with the plan. She is an interior design student, and she came up with so many great ideas of how to make a great sewing room. I have my sewing machine and overlocker in front of the window, to get as much natural light as possible. At some point I’m hoping to upgrade into industrial sewing machines – I worked as an industrial seamstress for 7 years, so these smaller machines sometimes feel a bit too slow for my taste. But as long as I have a limited amount of space available, these will do fine. Little by little I’ve collected equipment to help me do my sewing better and more efficiently. I want to keep the counters clear and empty so whenever I can, I use the walls as storage space. 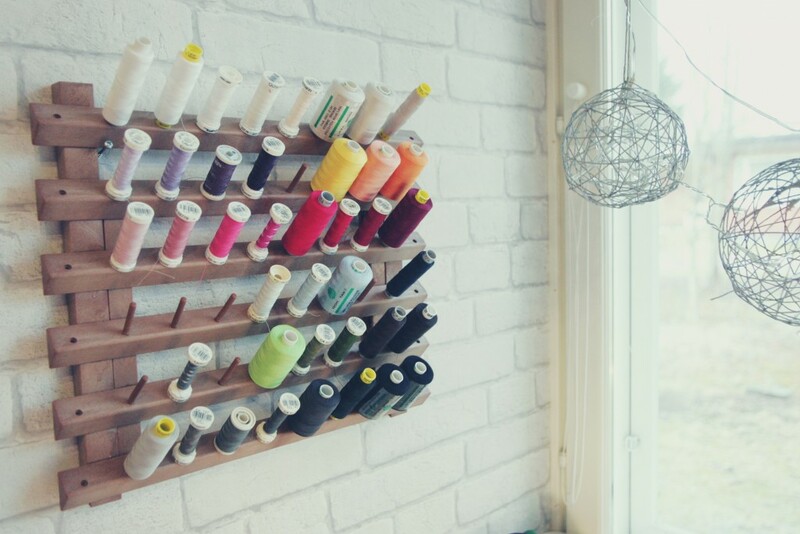 I have my rolls of thread ready right next to my sewing machine, and all the cutting tools hanging above my cutting table. The other counter in my little atelier is covered with two large cutting mats. 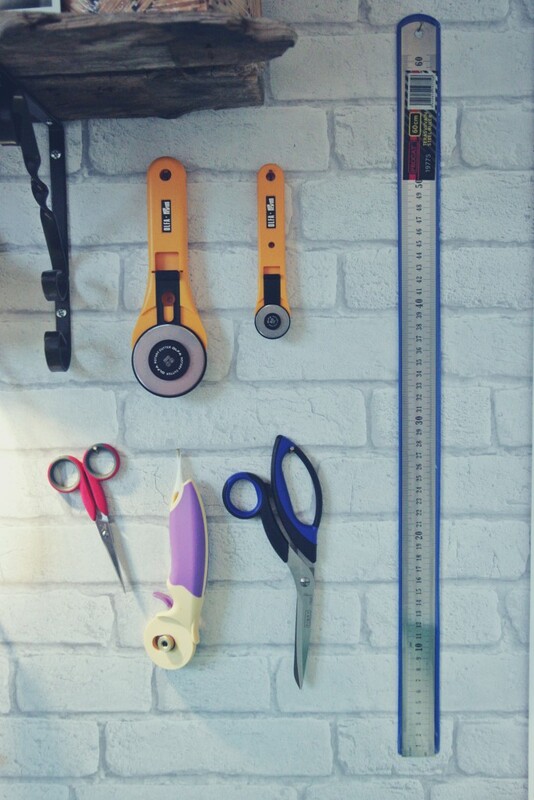 This is where I draw and cut patterns, and eventually fabric pieces for my clothing. 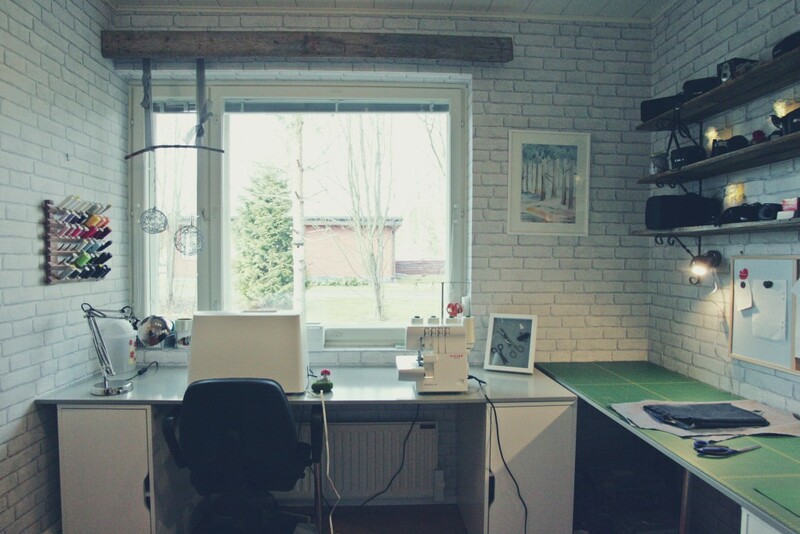 It also doubles as my office desk whenever I need to work on my laptop, do my bookkeeping or other things like that. On those beautiful, old shelves I have my vintage film camera collection. I wanted to keep them somewhere I can pick them up easilly and start shooting. The watercolor painting on the wall was a present from my talented sister, and the lovely collage of vintage scissors and sewing supplies I got from my friend for Christmas. I truly believe you should surround yourself with things you really love, it’s good for your creativity. I recently moved the rack of finished items into another area. I noticed it was easier for me to concentrate on my work when there’s less clutter around me. So when I’m working, I only have my patterns, the dressmaking doll, a steamer and an ironing board in the room. I’m currently renewing the other spare room in our house. It will become a fitting room / photoshoot space with a nice wallpaper background and some mirrors. I promise to post pictures when it’s ready! 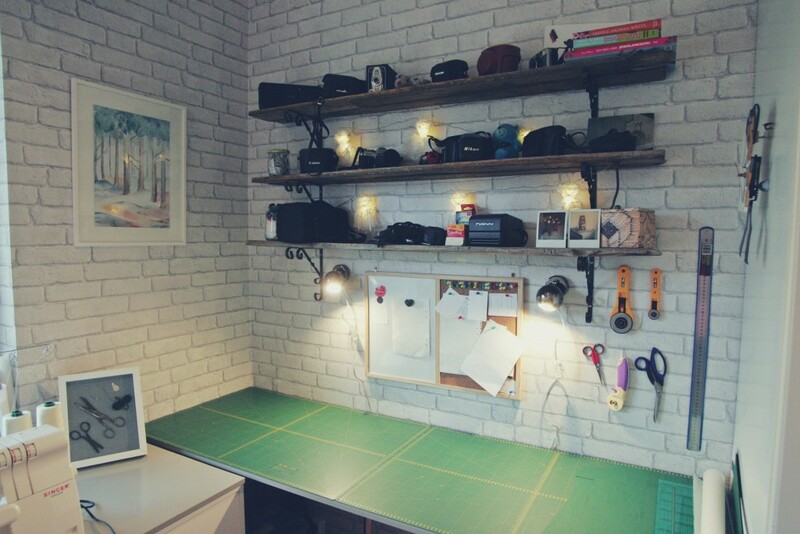 Do you have your own workspace? 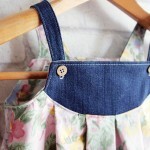 Any tips on working from home, or working in a sewing studio in general? This entry was posted in Design Studio. Bookmark the permalink. You did it! You turned a dream into reality, that is what living Life is all about. I can’t wait to see more of your clothing ideas. It is such a wonderful concept. I wish you all the success in the world!